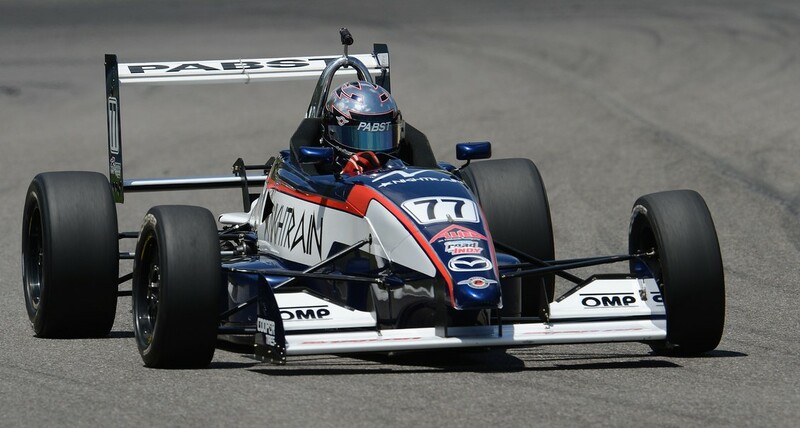 ​Just to start, it was so cool to be able to race at Indianapolis Motor Speedway! The only thing that would have been better, would have been going down the straightaway the other direction. The race weekend started out with a couple test sessions and practices. We were solidly in the top 10 each time we were out on track. Qualifying, my main focus for the weekend, was up. It started pouring before we rolled out on track, we all switched to wet tires and were going in blind with what to expect. Throughout the whole session we bounced around the top 5 and ended in P5 to start Race 1. Race 1 was kind of a crap shoot. It rained right before we went out, and our race was declared wet. But as we pulled out onto the track, the sun came out. During the race the track dried quickly and the rain tires became worthless. A few other cars came in the pits for dry tires and passed their way back up. I still finished the race solidly in P8. Race 2 the field was all jumbled around because of the varying times from Race 1. I started P10. As soon as the green flag fell, I was passing cars. By the end of lap 1 I had passed four cars. Halfway through lap 2, I had passed two more cars putting me P4. Just as soon as I had put myself into the top 5, I took myself right out. Going through turn 9, I dipped my left front too far off the track into the grass, hooking it around the curb, and spinning me out. I recovered quickly and followed in directly behind the last car. Battling my way back up the field, I was knocked off course, into the air and into a gravel trap. It took the safety crew a lap to get me out, putting me a lap behind from the rest of the field. Even with a bent car, we were able to still run the third fastest lap of the race. Despite not being able to prove our competitiveness in the races, I was able to complete my main goal for the weekend, qualifying near the front. ​This is the race I had been looking forward to all year. Not only do I enjoy driving the ovals in these cars, I also enjoy driving on tracks, like Lucas Oil Raceway, that have such great history. Another great thing about the weekend was that we were given a ton of track time. Throughout all of the tests I remained around the top 6. After testing, the lowest we ever were on the charts was P4! That right there shows how well my Pabst Racing boys and I worked to consistently remain up front. Qualifying went very well. Our 77 car was on top for a while, with two identical lap times. Only one car was able to knock us off the top spot, putting us in P2. Racing at Lucas Oil Raceway is very tricky. With the high line being the fastest and the preferred line, patience is needed to be able to perform well. The polesitter chose to start on the outside, as expected, for the race. When the green flag flew, I was only just inches ahead of the polesitter after the start finish line. I dove the car down into turn one as hard as I could, almost clearing the car to my outside, but it wasn’t enough. He was able to keep me under him and drove around me by the end of the first lap. I maintained a solid gap between me and the leader for 15 laps, while I was waiting to reach lap traffic. When we closed in on the last place car, I was planning my move. Just when I decided it was the right time, third place took advantage of the situation and passed us both, using the leader as a pick to get around me. Now in third place, I had to make the middle of the track work for me. It took a few laps to finally get around second place. He definitely made me work hard for it though, shoving me down to the bottom of the track and making wheel-to-wheel contact on a couple occasions. After I completed the pass for second, I was more than five seconds behind the leader. I put my head down and kept pushing hard to catch back up. Lap after lap, I was closing the gap, between running faster lap times and working through traffic better. Unfortunately, I was only able to close four of those five seconds, but finishing in second place is still awesome! 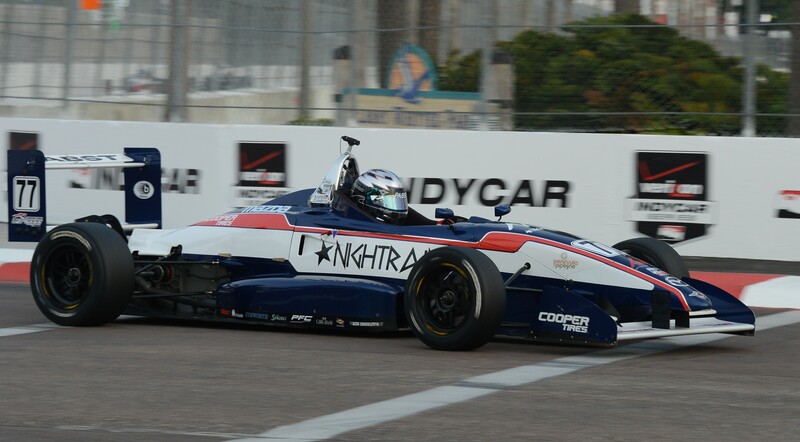 I was able to experience my first ever USF2000 podium, the infamous hat dance, and even the champagne shower! I am very happy with our results in the race and qualifying. Lucas Oil Raceway is going to give us huge momentum heading into Toronto, where I look to prove that I can drive just as well on roadcourses as I can on ovals. Big thanks to Pabst Racing, Nightrain Clothing, OMP America, Snap-On, and my awesome parents for making weekends like these possible! Next up, the Streets of Toronto.